Love is in the air, and a great way to show that love to someone special is to prepare a hearty breakfast for Valentine's Day. This month were gathering breakfast items for our food storage. Our focus items are breakfast cereal, oats or oatmeal, pancake mix, pancake syrup, and powdered eggs. You can always make pancakes and waffles from scratch with long-term foods, but during a disaster you may want some pancake mix on hand. Breakfast recipes are the easiest food storage meals, and Crystal's got some great ones at Everyday Food Storage. 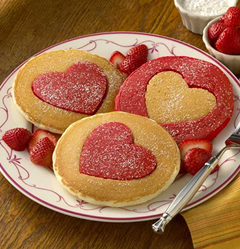 Check out these cute heart shaped pancakes from AuntJemima.com. I think I could even make these. When you need a backup, powdered eggs are simple to use in your everyday baking or in an emergency. I prefer to stock up on a 3-month supply, but feel free to stock up on more if you wish. For a great post about powdered eggs, go here. And Honeyville Grain has an excellent article too. Powdered eggs are simple to use. I use them periodically for baking. Be on the lookout for some great breakfast cereal deals this month. I like to stock up on as many as I can of our favorites. February is National Hot Breakfast month, so you may find some items to put aside in your freezer as well. And watch for grocery sales around President's Day weekend. This is National Children's Dental Health month [see these games for kids], so we're stocking up on our toothpaste, toothbrushes, floss and mouthwash. Because this is American Heart Month, remember to donate blood in your area. To find out where, go to RedCrossBlood.org. Also remember to wear red on Friday, February 4th. Counting a little bit of food storage each week will keep you stay on top of things. The food storage categories to inventory this month are: Snacks, Beverages, Canned Beans, Meat & Soup, and Cleaning Supplies. While you're communicating with your family over breakfast, don't overlook the importance of having good communications equipment during an emergency. Cell phones are great, but in the recent wind storm here in December, one of the cell towers went down and some people couldn't use them at all. Texting is still the best way to use a cell phone in an emergency. Also consider getting a NOAA radio like the Kaito KA009 as well to hear the necessary emergency information in your area. You are free to print it and give to others. Please mention my site if you share it. "Eggs, powdered 1/4 #10 can (2/1 $14.99 #10 can Emergency Essentials)"
Does the "2/1" mean that Emergency Essentials has a #10 can on sale, 2 for 1, for $14.99? I just looked at their website, and that's not what I see, but if you know of a deal that I'm missing, I'd love to be in on it. Thanks! That would be a good price. No, the 2/1 means February 1. I will change that so others don't get confused. Thanks! Ah, of course! Thanks for clearing that up for me. Have a great day! I have a question...I was looking at your February List and saw that dental products were on the non-food list. I was curious how that is bought...is it 1 toothbrush for each of the three months or 1 toothbrush for the three months. Same with the toothpaste - it says 15 each. Is that 15 per person or per month? What size tubes are you talking about with regards to the toothpaste?